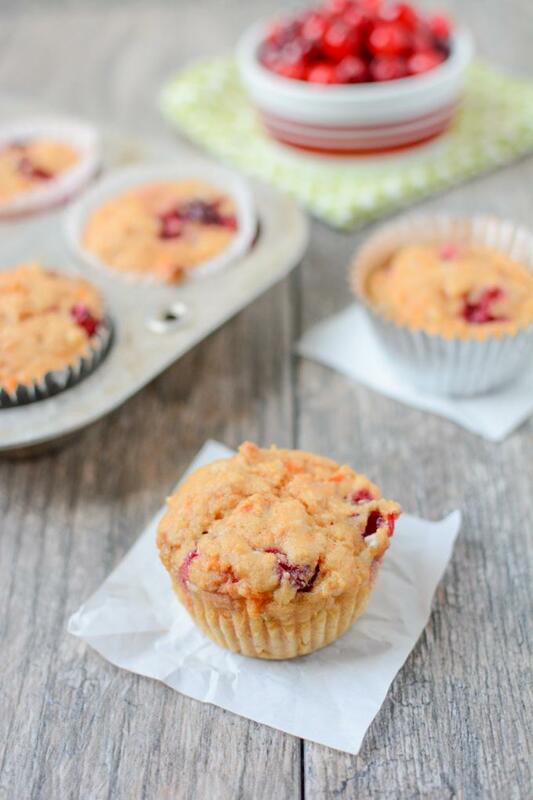 Lightly sweetened and packed with protein and fiber, this recipe for Cranberry Sweet Potato Cottage Cheese Muffins makes a great grab-and-go breakfast! Let’s talk about cottage cheese for a minute, shall we? I’ve never been a fan. There’s something about the little curds that just kinda freak me out. Hubby loves the stuff, however, and it’s a GREAT source of protein so I’ve decided I’m going to give it a fair shot. And by fair shot I mean, you’ll never catch me eating it plain, but I’ve decided to see if I can start to like it by hiding it IN things. First I tried pancakes. Hmmm, they were ok…but I’m still working on them. So we’ll come back to those. *Note- cottage cheese can be quite high in sodium so make sure you compare brands and try to find the one with the lowest sodium! Next, I tried muffins. When I googled cottage cheese muffins, most of what you find are cottage cheese egg muffins…which are on my list, but I was looking for more like a real muffin…I was envisioning something that maybe replaced greek yogurt with cottage cheese. I started thinking about how I could add some sweetness and I kept coming back to sweet potatoes -one of my favorite fall veggies. So, I decided to just give it a whirl. This is one of the biggest experiments to ever take place in my kitchen! Add flour and baking powder and stir until just combined. Scoop into greased muffin tins and bake at 350 degrees for 30 min. Pretty darn easy if you ask me! I have to admit I was skeptical as I put these in. But then I ate one when they came out of the oven…and it was good! And then I ate another one for breakfast on Sunday morning, with my coffee, after heating it up for a few seconds in the microwave. So I did. They’re packed with protein, have some fiber and are just the right amount of sweet, without a lot of added sugar. Win! Let’s chat! Are you a fan of cottage cheese? Have you ever baked with it? Ohhh, how festive!! I love that you added cottage cheese, I’d never think of that before! I guess it would be pretty similar to adding greek yogurt though. I LOVE cottage cheese. Just had a bowl with protein powder and melted cherries, in fact. 🙂 It can be insanely high in sodium. FYI – Friendship make a no salt added version. I can find it at Publix here in ATL. I have never baked with cottage cheese and don’t think the thought would have crossed my mind – but it’s brilliant!! I am buying cottage cheese this week. I am SO excited for these muffins!!! They’re making me so hungry staring at them. i do like cottage cheese just buy itself, but these look good and perfect for fall/thanksgiving! I can’t seem to get myself to like cottage cheese… as much as I try. But I love it in recipes! Going to the store to make these asap! Do you think they would still be good with oat flour instead of regular flour? WONDERFUL recipe Lindsay!! I love how you add secret protein, fiber, and….calcium! I’d have to use the lactaid brand of cottage cheese, of course, but it’s actually really tasty. I would have never thought of this combo–you’re so creative! I am SO NOT a fan of cottage cheese. In fact, it is one of the only foods I truly hate. However…it’s mostly a texture thing so I would definitely be willing to try it in this form. Sounds too yummy not to. I saw this on Instagram and immediately came to the site to read the recipe. This is just the perfect little appetizer or treat during Thanksgiving!! These sound yummy!!!! You think i could use GF flour?? I’m thinking of trying these with oat flour. I can’t wait to try these! I’ve been looking for a new way to use some of the sweet potatoes I get from the farmer’s market. Thanks for the recipe! These look awesome! I love how different they are from your typical muffin recipe! The addition of cottage cheese and sweet potato really makes them! Oh. my. God. You really know how to make me drool woman. And I love using cottage cheese, such a good clean tasty protein! Now these just look delicious. I LOVE cottage cheese! And these muffins look delicious! I feel the same way about cottage cheese…eek! But I would definitely try baking with it! These look great! Oh and I LOVE your mug!! i must say, i was skeptical when i saw your pic on instagram, BUT i think i want to try them now. my husband loves cottage cheese and i’m pretty grossed out by it but i do like it in things. my friend makes cottage cheese cookies every christmas that are great! This looks awesome!!! I actually love cottage cheese but know it is TOTALLY a texture thing for so many. (didn’t realize the sodium thing, good tip, as I go check mine…lol). How much protein do these clock in at, cals? I’ll calculate it myself if you haven’t though, no worries, just curious 🙂 Nice experiment gone WELL! I love all the fun things you can do with muffin tins. I use them every day to make me some yummy muffin like goodness! Those look SO good! I’ll definitely be trying those. I am a fan of cottage cheese, but have never cooked with it! I’m not a fan of cottage cheese by itself, but I would definitely be open to cooking with it! These look delicious, and very creative! I actually really like cottage cheese, but the one time I baked with it, the recipe was a fail. 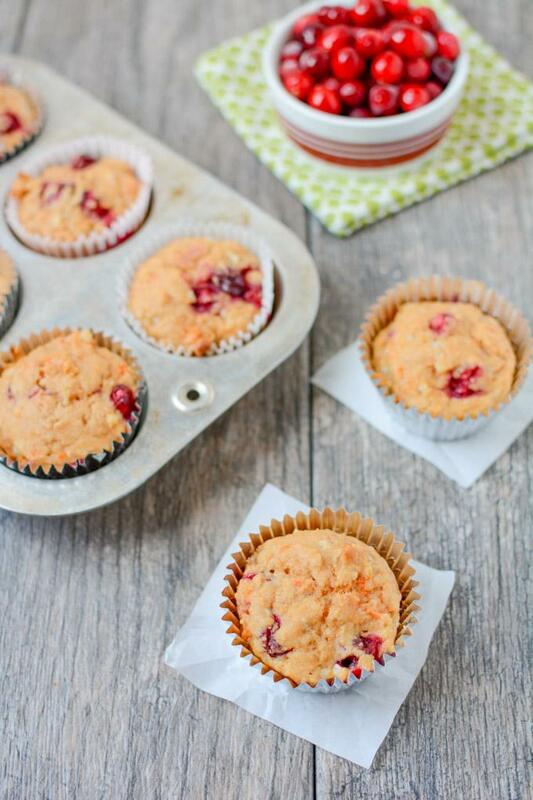 I love cranberries..I’m going to give these a try! I love cottage cheese but am trying to reduce my dairy. And you’re right it can be high in sodium. I’m more likely to try and hide the sweet potato. I’ve baked with cottage cheese but honestly I like it with a little honey and almonds. Yum! Yum! I love adding cottage cheese [and PB + cinnamon] on top of sweet potatoes so I bet these are tasty and would love to try them! Have you ever sliced muffins in half horizontally and toasted them? I love the crispy edges they get and with a bit of apple butter or PB, I bet these would be delic that way too! I’m VERY much not a fan of cottage cheese, which is why I haven’t baked with it before. I’m worried stuff will come out sour. But if you don’t like cottage cheese either and liked the muffin results, maybe I will try it! so so glad you liked them! Thank you for this recipe. This is my new favorite muffin and my 10 year old sons. I made a double batch based on your reaction. I did not realize it was so easy to bake with fresh cranberries. I don’t think I will bake with dried cranberries ever again. i’d say go for it! the sweet potato taste isn’t super overwhelming…it just helps make them sweet! ooooh love the apple idea!! awesome! you could try a different kind of flour! I’m a cottage cheese lover as it is, and these sound yummy! As for baking with cottage cheese, I’ve never used it in muffins, but my mom used it for a substitute for ricotta cheese in recipes for as long as I can remember. Cheaper, adds good flavor, and I run mine through the Ninja to de-curd it (so the kids and hubby will eat it). These look great, can you actually taste the cottage cheese in them or not? No, i don’t think you can taste it. they’re a little more watery than typical egg muffins so you could try making a batch with a little less cottage cheese to see if that helps…but i didn’t specifically taste the cottage cheese itself. Really good healthy breakfast option with protein. I used blueberry then in my next batch used coconut, chocolate and marshmallows for a not as healthy dessert option!! Sorry they didn’t work out for you! I’ve made them several times successfully. They’re definitely a moister muffin so I store them in the fridge. White whole wheat flour is whole wheat flour, it’s just a lighter version. whole wheat flour is typically pretty dense and this is more like the consistency of white flour, but it’s still whole wheat. you can find it at the grocery store in the flour aisle! These look amazing! I make 4 dozen muffins and freeze for my kids who are both grad students to grab and take…as breakfast and as a snack. The next batch will be these- I will quadruple the recipe and add chia and flax meal and oats as the additional dry ingredients and maybe some walnuts for crunch. great recipe, thanks. One question though.. I used whole wheat flour instead of white whole wheat because that’s what I had on hand. They turned out a bit more dense than what I had thought they would. Would it be due to the flour substitution, or is it just a denser muffin? Either way.. It still tastes amazing! whole wheat flour is definitely a bit denser than white whole wheat. but these are also denser muffins so i think it’s probably a combination of both! Wow! I haven’t followed a new website in a very long time! I’m looking forward to catching up on yours and reading many more in the future!!! 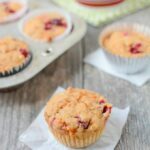 I stumbled upon this recipe after recently beginning a ‘clean’ diet and loved the creativity of the muffins. Quick question…I subbed in coconut flour for white wheat flour with the same proportions and ended up with baked crumbles. Don’t get me wrong, they were delicious baked crumbles, but they didn’t hold a muffin shape. Do you think this is because of the flour sub? I will definitely be trying this again with normal flour! I don’t have any experience with coconut flour but I would guess that might be the problem! I just wanted to reply and let you know that I remade these muffins and they’re awesome! 1/4 cup coconut flour subbed for the 1 cup wheat flour and a little extra milk and the texture was perfect. Thanks for posting! Thanks for doing the research on this one. Love new ways to cook healthy and these look delicious! i haven’t tried it! They should work fine, but if you try it, let me know! [WORDPRESS HASHCASH] The comment’s server IP (72.233.44.22) doesn’t match the comment’s URL host IP (72.233.69.6) and so is spam. [WORDPRESS HASHCASH] The comment’s server IP (216.151.210.45) doesn’t match the comment’s URL host IP (74.200.244.59) and so is spam. [WORDPRESS HASHCASH] The comment’s server IP (66.135.48.170) doesn’t match the comment’s URL host IP (72.233.2.58) and so is spam. [WORDPRESS HASHCASH] The comment’s server IP (66.155.9.44) doesn’t match the comment’s URL host IP (76.74.254.120) and so is spam. [WORDPRESS HASHCASH] The comment’s server IP (192.0.80.48) doesn’t match the comment’s URL host IP (192.0.81.250) and so is spam.